Pretty parasols made of paper and wood to keep you cool in the heat are a decorative and useful extra. Available in white, pastel pink, magenta, turqouise or soft purple. Bouquets and flower arrangements in any style that might take your fancy are available from our excellent florists. We can provide decorative chairs, seat covers, aisle carpets, porcelain, glasses, candle-holders, chill-out furniture, bars, and anything else connected to making your day more enjoyable and beautiful. Our top stylists are available for your hair and make-up and to help you and your bridal party look your very best! Order a spa team to where you are and enjoy a relaxing day of beauty treatments a day or two before the wedding, or let us organise a spa party at one of Mallorca's top spas. We can arrange a party tent in a garden with lovely chandeliers, golden chairs and tables with vintage style flowers. Our balloon team is ready to make your guests smile! We also have excellent children's entertainers and top nannies to keep younger guests safe and happy. 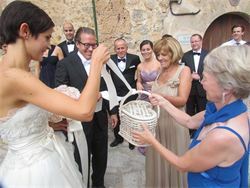 A candy cart or table provides a very decorative addition to the wedding - with cakes as well if you like. Beautiful and delicious wedding cakes in a range of flavours, shapes and fillings are waiting to be ordered. Cup-cakes are a popular alternative and we can also provide macaroons and lovely decorative wedding biscuits to give away as favours. Our caterers are hand-picked to create the perfect wedding meal for a range of venues and budgets. Their menus range from elegant three- or five-course tasting menus to finger-food buffets and informal Mediterranean sharing feasts with a mix of barbecue, tapas and paella options. Choose from locally-inspired Spanish dishes or international cuisine. How about a mobile cocktail bar, complete with expert staff, and cool white chill-out furniture for your wedding party after dinner? Hire a historic tall ship, cruiser or yacht for a welcome party or post-wedding excursion. 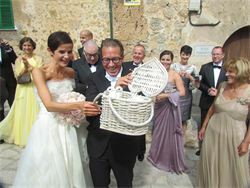 Here come the bride and groom - in a rustic donkey-drawn cart! Here comes the bride - with her bridesmaids in a vintage white VW Beetle! And an elegant White Rolls Royce Silver Cloud is available too! 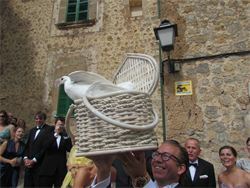 It's always a delight to see everyone smiling as the doves are released from their white, heart-shaped baskets. 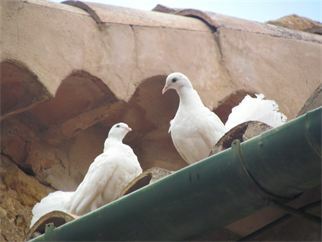 Our birds are beautiful pure white homing doves from Mallorca. 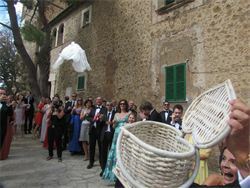 When the bride and groom open the basket, they head for home again.